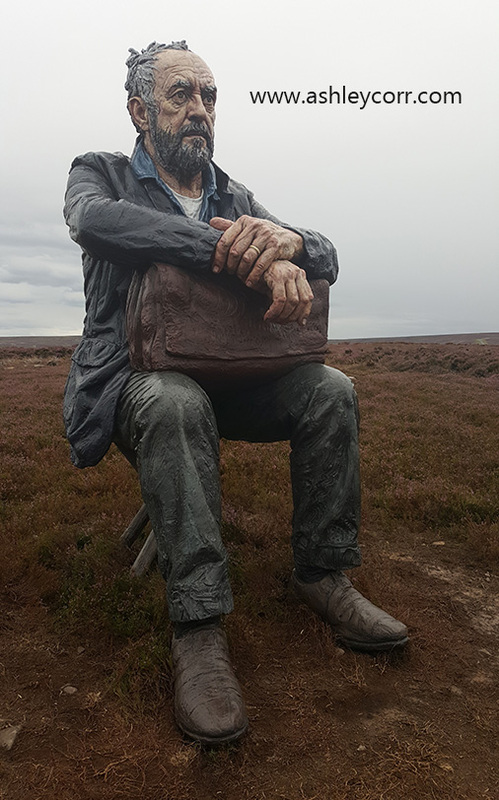 Yes, it's a trip south, into North Yorkshire for a recce visit to a statue on a hill in the middle of nowhere land. It was a chance sighting of the statue that caught my eye whilst browsing the internet, one rainy Friday morning in August. I was sitting down with a cup of tea, trying to shake off my night shift jet lag, when I first noticed The Seated Man, in situ on Castleton Rigg, overlooking the tiny Yorkshire village of Westerdale. At first I was a little confused as to what the statue actually represented. All I could see was an elderly man sitting on a seat, with a brief case resting on his knee. His facial expression was one of deep thought - definitely a pensive mood going on here, I thought. And it suddenly struck me that he resembled Jeremy Corbyn, without a doubt. Well, well, well ... I need to visit this statue in person and I need to visit it soon. I originally had nightscapes in mind. Star trails, milky way, moon shots ... and this place seemed like the ideal spot, as it was in a dark area away from light polluted urban areas, that would and could have a negative effect. There was a carpet of heather surrounding the statue. I could only imagine how nice it would look during the day, when bathed in sunshine. That's it, my mind was made up - I'm heading down there, first chance I get. It's only an hours drive from home. That'll do nicely. Within 48 hours I was heading down there to check it out, in the flesh, with my brother Chris. The weather was poor, very poor in fact - certainly not a day to be walking on the moors, but what the heck ... this WAS a recce visit after all. My satnav took me into the village of Castleton, before I headed out and across the moors road towards Castleton Rigg. From this vantage point we got our first glimpse of the statue in the distance. 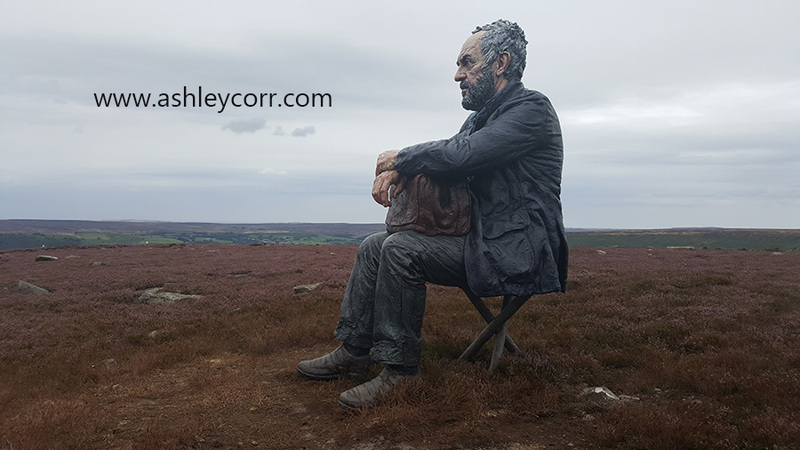 I parked up at the roadside and we headed through the heather and up the hill towards the main man, accidently disturbing a few grouse on the way. That was funny - not for me, for the grouse. I almost shat me'sel a few times over. Once we'd negotiated the incline, and the grouse ha, we were on the flat moor and heading towards the statue, which we could see directly in front of us, approximately 100 metres ahead, with his back to us. Within no time we were standing in front of this amazing statue. Amazement was my first thought as I stood in front and admired the artistry in front of me. 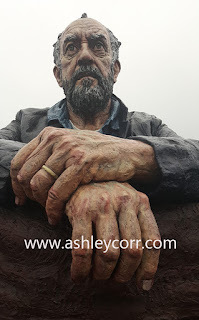 This bronze statue stood around 3 metres in height and the detail was outstanding. All I could think about at this point was returning another day to photograph him in better conditions. The heather was in full bloom, although its colour was almost non-existent under this overcast lifeless sky. I wanted sun and lots of it. I wanted blue skies and broken clouds. I wanted perfect conditions. I wasn't asking for much, was I? Should those pieces of the jigsaw fall into place then it was down to me to do some damage with the camera, to complete the puzzle, so to speak. I was up for the challenge - just give me my conditions and I'll try to deliver. Time to return home. Recce over. I already had the photographs in my head, but they were no good in there - they had to appear on my memory card, ticked off and uploaded to ashleycorr.com. I was glad to get back to the car, to be honest. The rain kicked in as we left the site and the winds didn't help the situation either, but this was a recce after all. Groundwork done. Just a waiting game now. Come on Mother Nature, throw some sun at me and let's see the heather blooming in all its glory. I'M WAITING !